A gangbusters manufacturing number (with an asterisk)… an American expat barred from returning for a visit (you won’t believe this one)… a reader inquiry about the Iraqi dinar (it just won’t die)… and more! Are you on Social Security? Don’t spend all your 2018 windfall in one place. As mentioned here on Friday, the Bureau of Labor Statistics issued its monthly inflation numbers. The consumer price index is running at a 2.2% annual clip. The October numbers are what determine the annual cost-of-living adjustment, or COLA, for Social Security. But you’re not getting a 2.2% increase. You’re getting a 2% increase. If it’s any consolation… the 2% increase for 2018, meager as it is, is the biggest since 2012. Hold on, though. 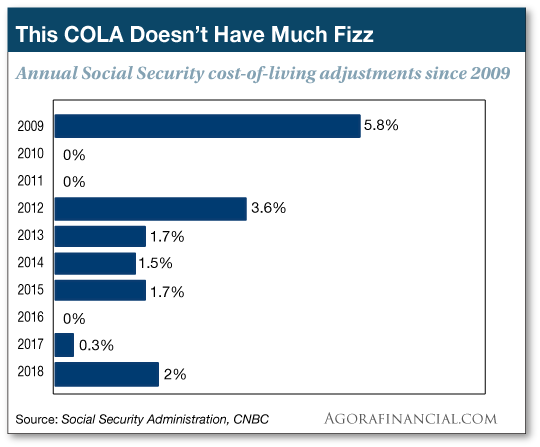 The 2018 COLA might vanish from your Social Security payment before it ever hits your bank account. That’s because of the arcane rules governing premium increases for Medicare Part B. Take note if your premiums are deducted from your Social Security payment. In theory, monthly Part B premiums for Medicare recipients who aren’t considered “high income” were $134 this year. But because of those arcane rules, many recipients were paying less than that — typically about $109. That $25 increase, by the way, is exactly the same amount as the COLA for the average Social Security recipient. Amazing how that works out, huh? The upside is that if you’re already paying $134 a month, you likely won’t see an increase next year — because under those arcane rules, it was people like you who got hosed with premium increases the previous two years. If you’re considered “high income,” however — that’s $85,000 single and $170,000 for a couple — you’re already paying higher premiums and you get hosed every year regardless. Depending on your income level, you might face premium increases up to $80 a month in 2018. “From each according to his ability, to each according to his need,” right? The major U.S. stock indexes are flat, still near all-time highs, as a new week opens. Gold is back above $1,300 for the first time in three weeks. No major earnings numbers this morning; traders are waiting with bated breath for Netflix to report after the close today. We’re getting our first read on how the economy is doing so far in October: The Federal Reserve’s Empire State survey — a measure of manufacturing in New York state — is its strongest in three years. We continue to caution this is a survey — “soft data,” as the expression goes. It only matters if there’s follow-through with “hard data” like sales. And the hard data have been lagging all year. Crude is pushing toward six-month highs at $52.05 — thanks to trouble in Iraq. Last month, ethnic Kurds in Iraq’s north voted overwhelmingly for independence. The vote might have been as symbolic and inconsequential as a similar vote in 2005, except for one thing. 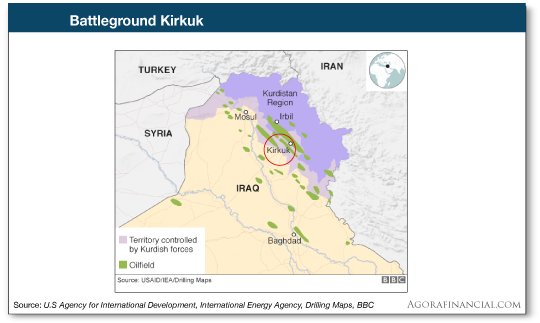 This time around, the Kurds are laying claim to the ethnically mixed city of Kirkuk, located in the heart of an oil-rich region. In 2014, ISIS moved to take over Kirkuk. The Iraqi army cut and run. But Kurdish militias quickly ran ISIS out of town and they’ve controlled the place since then. Meanwhile, the Chinese might be in line to own a chunk of the world’s biggest oil producer — Saudi Arabia’s state-owned Saudi Aramco. Reuters reports this morning that two of China’s “Big Three” oil producers have expressed interest in taking a 5% stake in Aramco. “The Chinese want to secure oil supplies,” an anonymous source tells the newswire. The Chinese rumors have been flying for weeks, but they really took off on Friday afternoon when the Financial Times reported the Saudi Arabian government was thinking about shelving plans for an Aramco IPO. If the objective is to raise money for the Saudi regime — and it is — selling a stake to the Chinese would be a lot easier than listing shares in New York or London. Ironically, the FT broke the story moments after President Trump announced he was “decertifying” the Iran nuclear deal. How’s that for gratitude? The Saudi regime is Iran’s archenemy and it’s been one of that deal’s biggest critics. Now it’s about to turn around and hand over some of its oil to China. Some “ally,” huh? Deep-pocketed investor Nelson Peltz might have lost his battle with Procter & Gamble… but he probably won the war, says our income specialist Zach Scheidt. The vote was close, but it went down to defeat last week. Interviewed by CNBC, Peltz claimed the reason is “ego” — the ego of P&G’s management who prefer business as usual. Zach, however, believes the company will adopt many of Peltz’s ideas — reducing income-sucking bureaucracy and boosting its bottom line. And now the downside to giving up your U.S. citizenship: Good luck coming back for a visit if you have a record, no matter how minor. For years now we’ve been chronicling the number of Americans who give up their passport — usually because they’re already living overseas and it’s a colossal pain for expats to jump through the hoops of U.S. tax laws. The number climbed steadily throughout the Obama administration, and it’s continuing under Trump. During the first half of this year, 3,072 Americans surrendered their citizenship. If that pace keeps up, 2017 will set another record. Which brings us to the plight of Alvin Queen, a native of Mount Vernon, New York, and resident of Geneva, Switzerland. 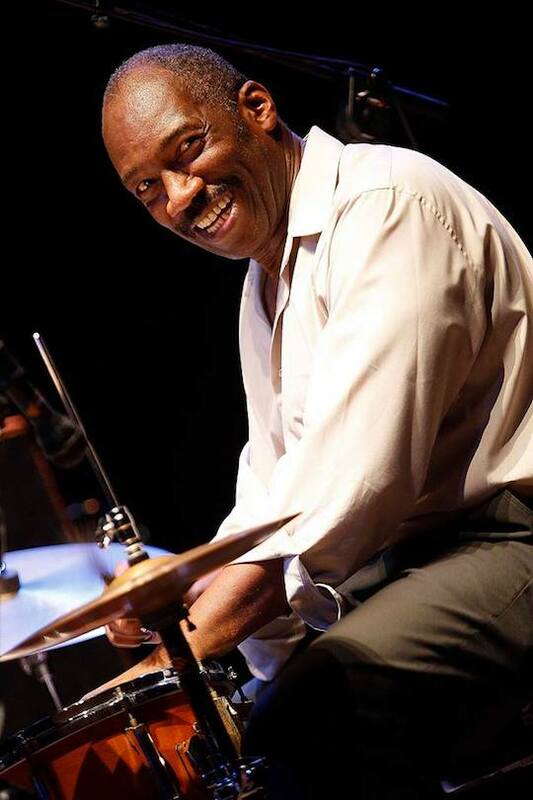 Queen is a jazz drummer perhaps best known for his work with the late, great pianist Oscar Peterson. He held dual U.S. and Swiss citizenship for 30 years — until he gave up his U.S. passport last year. He had a gig lined up next month in Washington, D.C. — a concert honoring the “Harlem Hellfighters,” black soldiers who fought in France 100 years ago during World War I. Queen applied for an O1B visa, the kind used by entertainers when they visit the United States… and was turned down. His fingerprints — taken 50 years ago when he was 17 — showed up in an FBI file. According to a press release from the concert’s organizers, Queen’s rap sheet consists of a DUI and a minor drug charge, neither of which resulted in a conviction. Nonetheless, getting a waiver from Homeland Security would have taken months — by which time the concert would have already taken place. Gee, don’t you feel safer with this man barred from the country? “As a speculative investor I’m all in on cryptos, but I also have invested in Iraqi dinars,” begins a new week’s mailbag. “Before we invaded Iraq the dinar was worth more than our dollar, I’m told. Since then, the value of the dinar plummeted but there are very many people — especially veterans and active military — actively and quieting buying them up on the cheap. Everyone is patiently waiting for a revaluation (RV). It was supposed to have happened last month, but it did not. “People keep buying, there are Facebook groups dedicated to it, forums, email alerts, etc. I’ve heard that when the RV occurs, it’s going to be 3.5 to 3.9. That would turn 100,000 dinars into over US$300,000. What does Jim think about this? What has he heard about a RV? Does he think it’s a scam? Or a possible, but unlikely situation. Man, this Iraqi dinar thing just won’t die. We’ve been getting periodic inquiries in The 5’s inbox as long ago as 2009. As it happens, Jim Rickards took on the question in this space in 2015. “I have followed the Iraqi dinar situation closely,” he said. “Sadly, it appears to be a scam aimed at returning U.S. veterans of the war there and at other Americans. A story has been concocted that the Iraqi dinar will be suddenly and radically revalued upward against the U.S. dollar. This would produce huge gains for holders of Iraqi dinar. P.S. Back to the paltry 2% Social Security cost-of-living adjustment: “If you polled seniors, 10 out of 10 would say the COLA is not keeping up with their costs,” AARP’s Gary Koenig tells The Washington Post. The good news is that if you have some capital to invest, you can keep up with rising cost of living. Best of all, you don’t even have to be retirement age to collect. And the payouts could start arriving before the end of this month. Check it out right here.